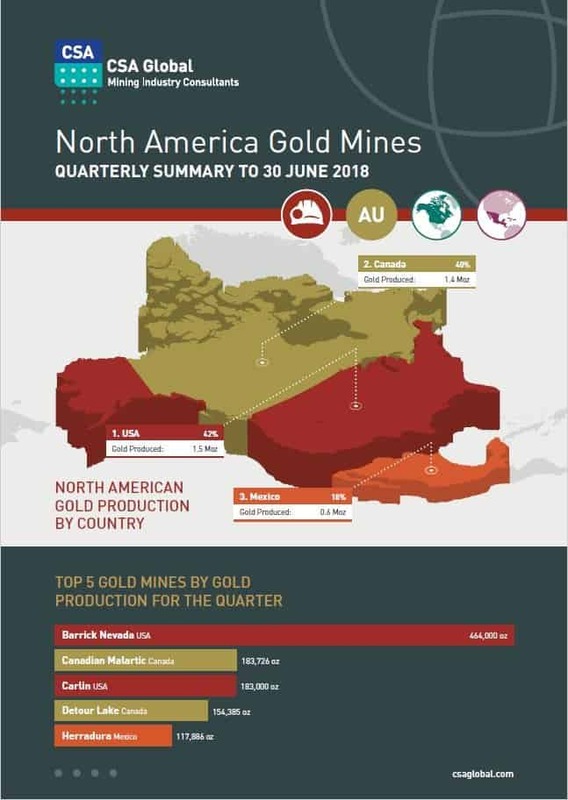 Welcome to our first edition of the North America Gold Mines Quarterly Summary produced by CSA Global. For the quarter ending 30 June 2018, reported gold production totalled 3.5 Moz, with USA the largest producer closely followed by Canada. Barrick Gold Corp’s Nevada operations in the USA once again was the largest gold producer with 464,000 oz, followed by Agnico Eagle and Yamana Gold’s Canadian Malartic mine (183,726 oz) in Canada and Newmont Mining Corp’s Carlin mine (183,000 oz) in USA. The average gold price (London PM Fix) for the quarter was US$1,306/oz. The average reported All-in Sustaining Costs (AISC) was US$1,005/oz and to be considered in the lowest cost quartile an AISC of less than or equal to US$719/oz was required. The mine with the lowest reported AISC was Goldcorp Inc’s Penasquito mine in Mexico with an AISC of US$490/oz, this was followed by Newmont Mining Corp’s Long Canyon mine (US$502/oz) in USA and Premier Gold Mines’ 40% interest in the South Arturo mine (US$506/oz) in the USA.